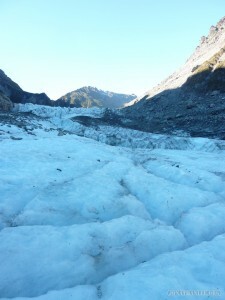 So what exactly is a glacier? It’s this giant block of ice that’s slowly sliding down a mountain, carving out a path through the valley. 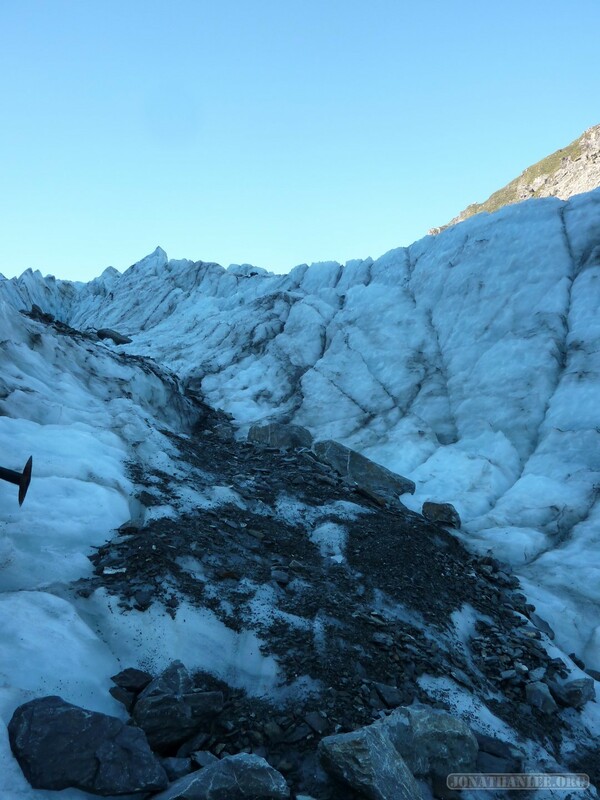 The iceberg gets something like 10 meters of rain per year, which freezes and adds to the iceberg’s mass – as the iceberg grinds its way down the mountain, it continues to melt, so the iceberg shrinks and expands depending on rainfall and temperature. Technically, the iceberg is a national park, so anybody can go and climb it. 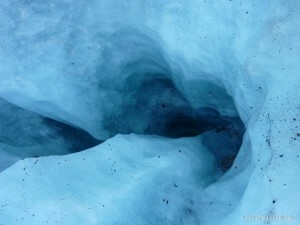 It is a pretty serious chunk of ice though, so it is highly recommended to go with a guide. 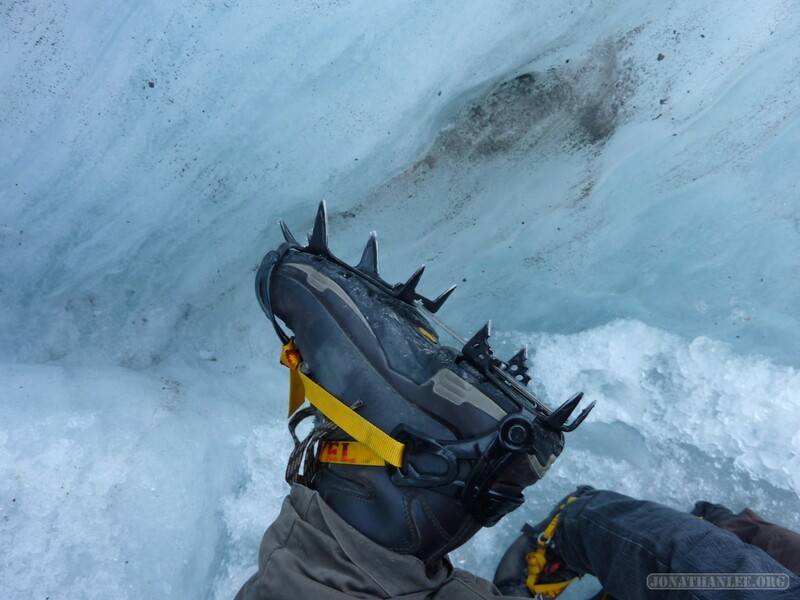 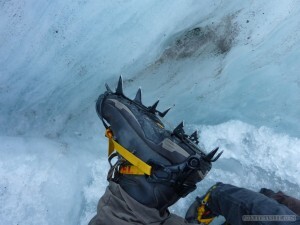 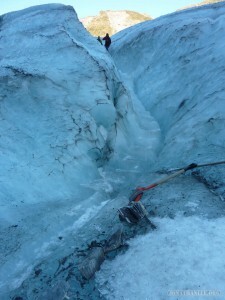 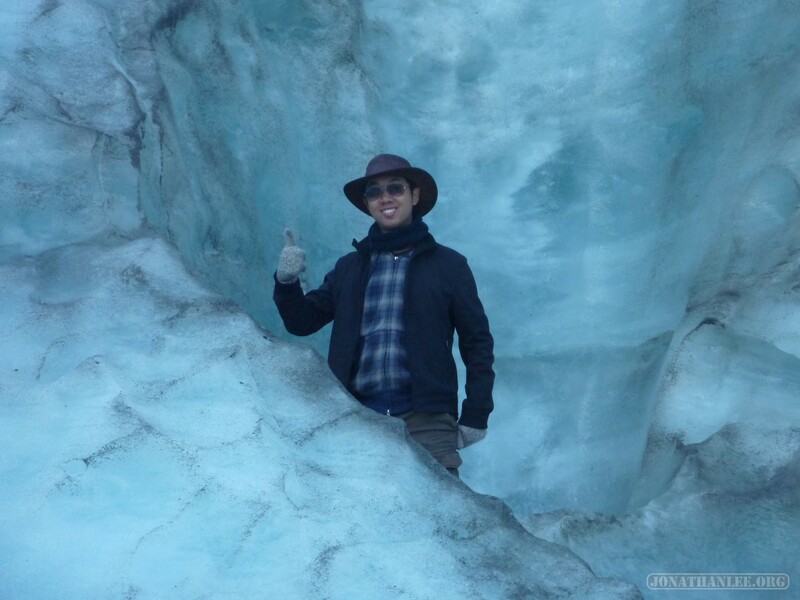 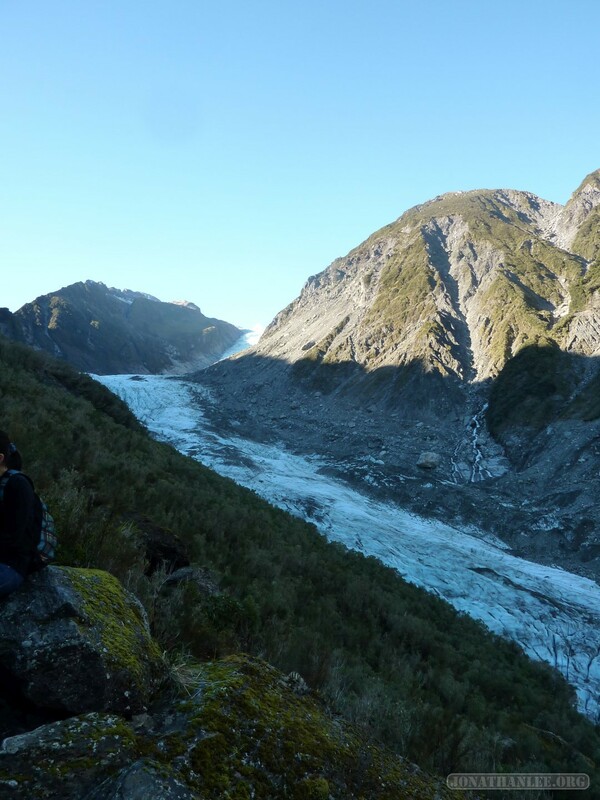 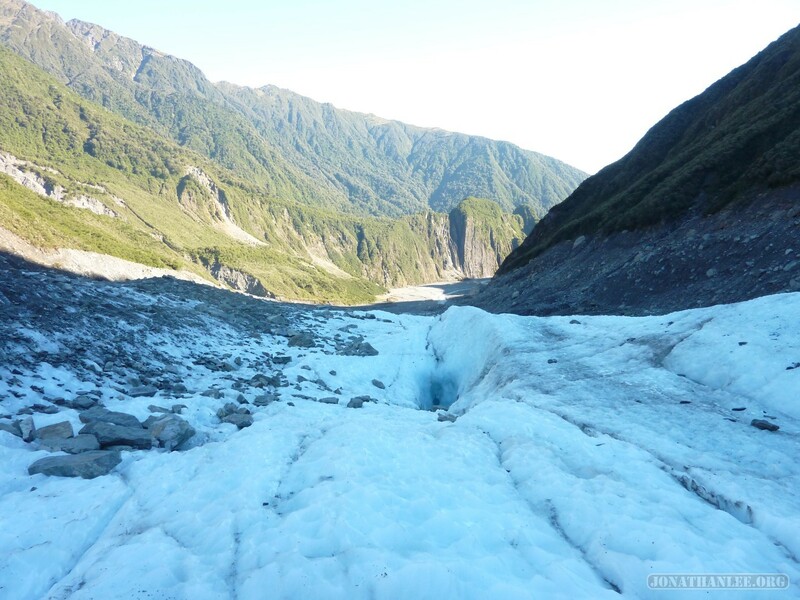 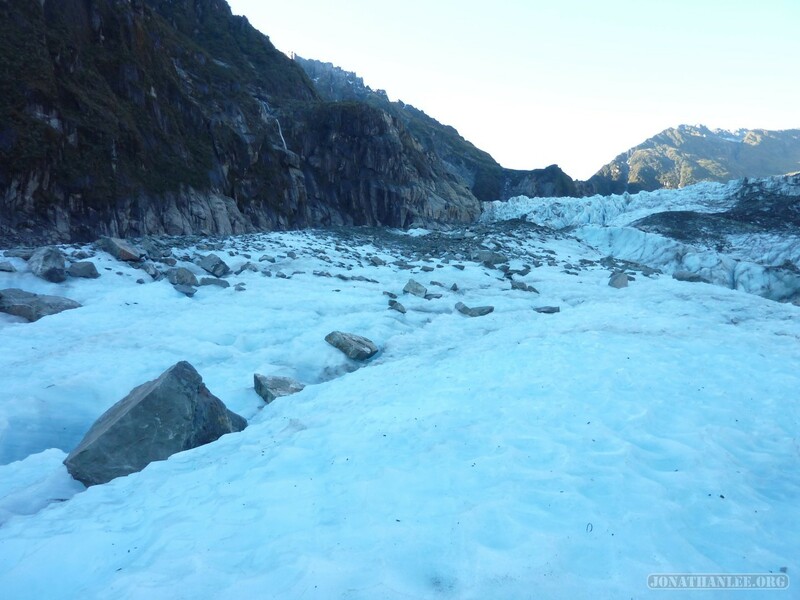 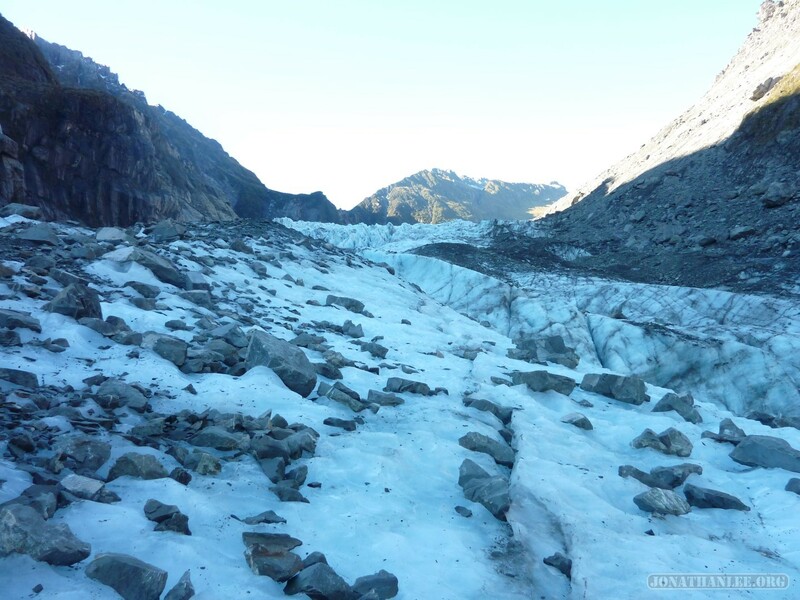 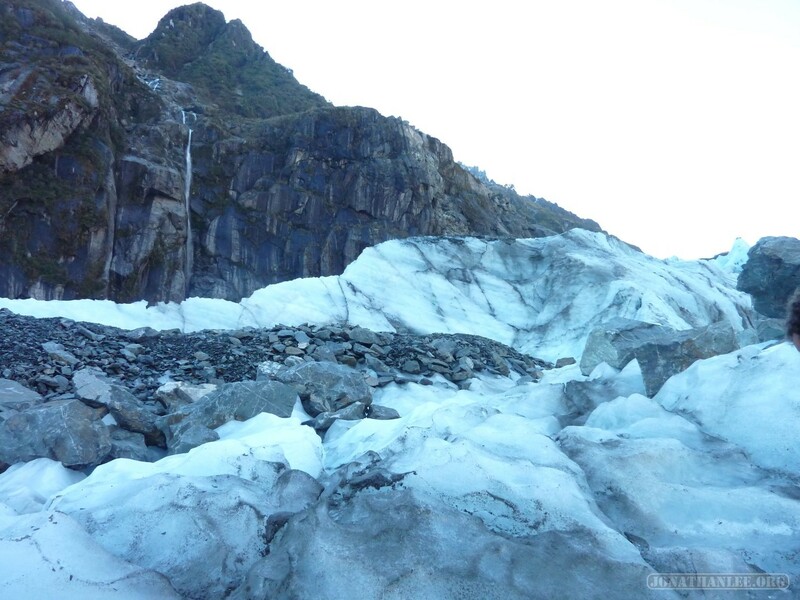 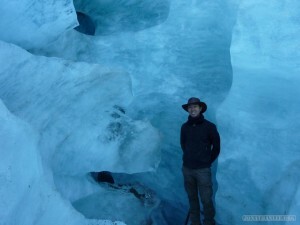 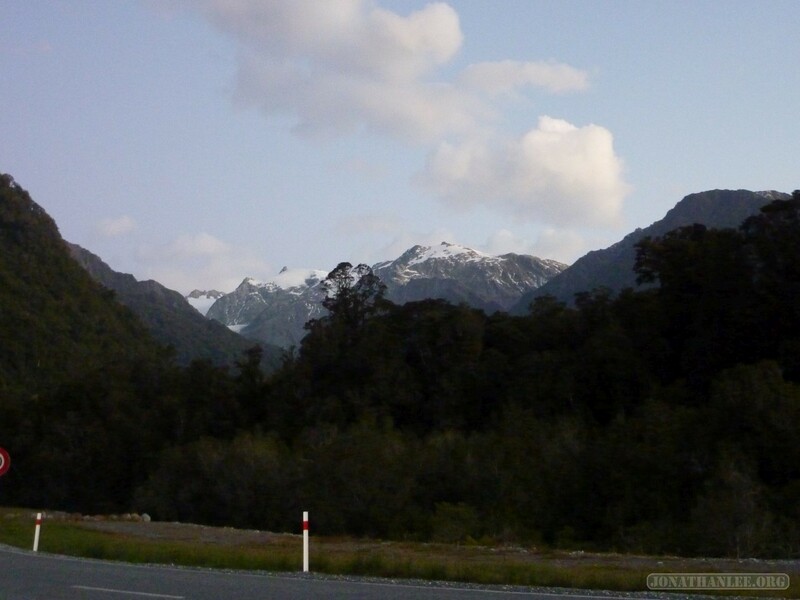 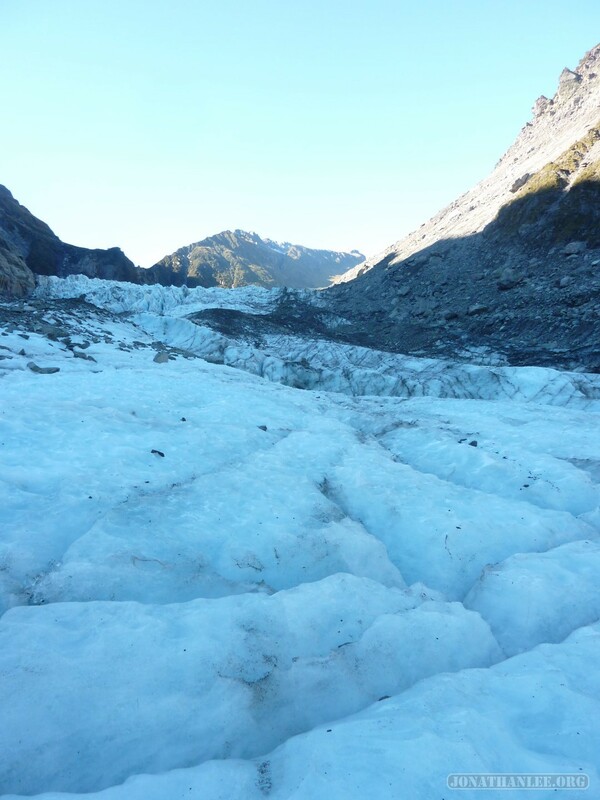 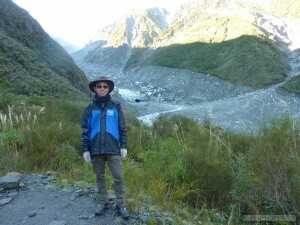 There are a variety of tours you can take – including being dropped off from a helicopter or learning to ice-climb, but we took a fairly generic tour – hiking up the mountain to the glacier (the face of the glacier is too unstable to climb), putting on crampons and alpenstocks, and climbing up and down the glacier. 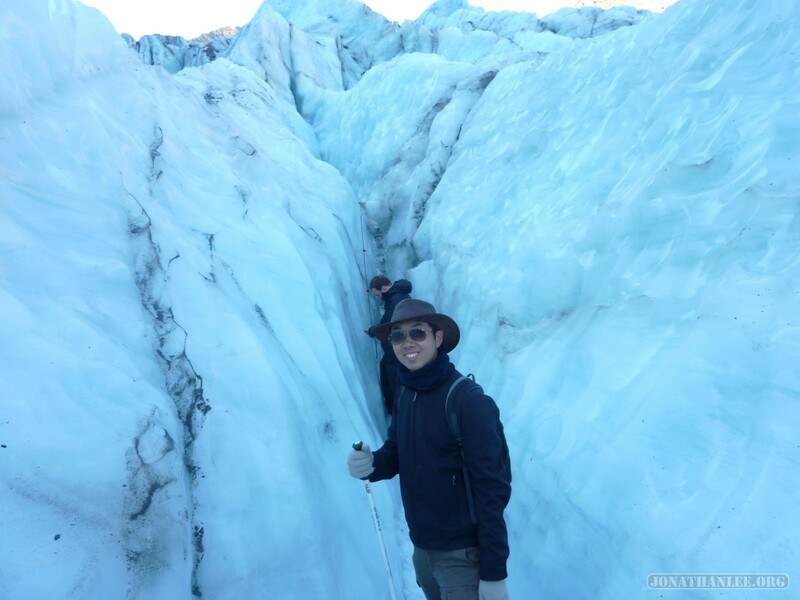 It annoyed me quite a bit actually – the guides were all ‘wait for me to finish chipping out a path, and follow exactly after me’, while I was all ‘I’ve got crampons, I’m got this pole, I wanna go explore’. 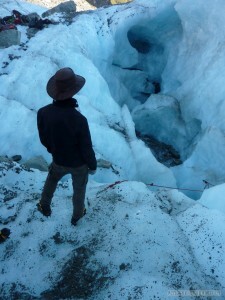 Whenever we got to a crevasse, the guide would only allow one person to view it at a time, with him holding on. 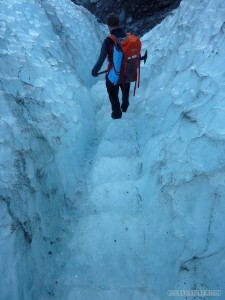 The crevasses were pretty damn cool though! Fun fact: if you fall into a crevasse, you don’t freeze to death, you suffocate – your body heat melts the ice around you, and you keep slipping down, until your chest is unable to expand and contract to breathe. 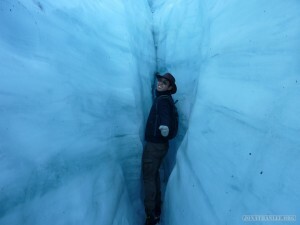 And finally, one last photo – taken as I climbed off the beaten track, as the guide was busy escorting away an unfortunate girl who had to use the restroom while on the glacier. (It was “quite an experience”, as she later confided).